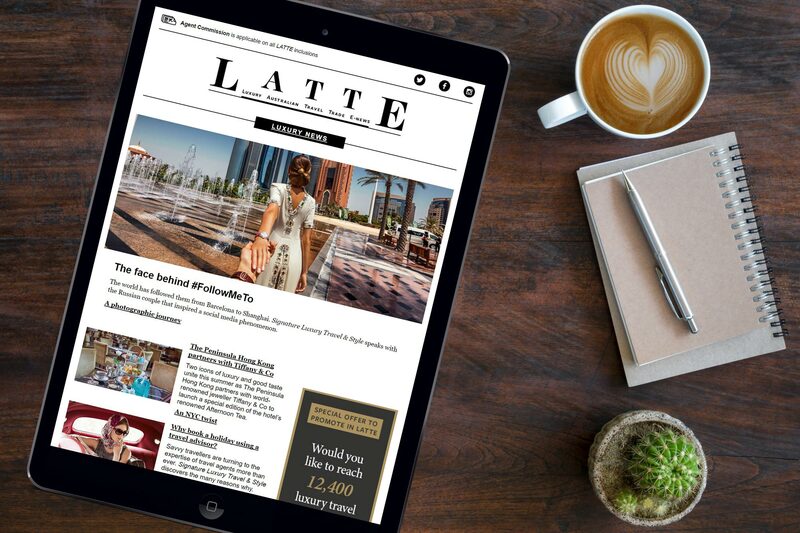 This week LATTE chats with Lisa Pile, Vice President Sales for Australia and New Zealand for Regent Seven Seas Cruises (RSSC). Lisa entered the cruise sector with RSSC in November 2015 after more than 24 years in the hotel industry, much of which was spent overseas and focused in the luxury space at a senior level with brands including Kempinski and most recently with Raffles Hotels & Resorts, where she held the position of Executive Director of Sales and Marketing – Global, based out of Singapore. After 18 years abroad, Lisa was lured home to Sydney to take on the newly created position with Regent Seven Seas Cruises, as part of the luxury cruise line’s expansion in the Asia Pacific region. She’s had the opportunity to cruise with RSSC half-a-dozen times since joining the company, in addition to a personal holiday in 2012 to the Mediterranean. One of Lisa’s most memorable voyages was the inaugural sailing of Seven Seas Explorer from Barcelona to Lisbon in 2016, where she escorted 75 travel agents from Asia Pacific. Lisa, with such an extensive hotel industry career under your belt prior to joining Regent Seven Seas Cruises, did you find it a challenge switching from the hotel sector to the cruise industry? It was really interesting. I actually found it a straightforward transition because you are simply moving from hotels to floating hotels. Every industry has its own language and jargon, and that was the hardest thing to understand at first. The shortening of terms and phrases can be so funny. I remember in my early days with Regent, I was in a meeting with Steve Odell [Norwegian Cruise Line Holdings’ SVP and MD for Asia Pacific] and other executives, and they were talking about the upcoming launch of Seven Seas Explorer. And they kept using this phrase “shakedown cruise”. Here I was, sitting around the boardroom table trying not to look stupid, saying “yes, yes, yes” but afterwards, I had to ask Steve, “You’re going have to tell me what this shakedown cruise is? !” And he looked at me, paused, and burst out laughing! He said, Lisa, “It’s just like your pre-opening for hotels, Lisa. That’s what we call the pre-launch of a ship”. It was learning a new language. But basically, everything else is the same, except of course your destinations are moving on a daily basis and of course the booking cycle has gone from 24 hours to 24 months. But I now work for the world’s most luxurious fleet of floating hotels and I have much heavier responsibility in selling destinations, rather than one location. How have sales been out of the Australian region for Regent Seven Seas Cruises over the past 12 months? We have been overwhelmed by the exponential rate of growth since we opened our office three years ago and we have created a heightened awareness of the brand in an already established luxury market. Forward business through to 2021 reaffirms our growing position in the market. 2019 has had some interesting twists with bookings much later in the cycle. Do you have any ideas on why 2019 is a little softer than in previous years? With prevailing geopolitical issues plus a fluctuating exchange rate we have seen some delays in decision making. That said we have had some very big days of sales during January and early February, so we are confident of another strong year. We’re still early into 2019, so is there a likelihood of further sales for this year’s program? Yes, the Europe, Alaska and Asia Pacific are still selling and there are some great deals available, especially for combination cruises. What are some of the most popular voyages and destinations for Australian travellers with Regent Seven Seas Cruises? Still number one is the Mediterranean. Over 60,000 Australians cruise the Mediterranean every year, so that’s a region that’s consistently very important for us. It’s our number one market and especially extended sailings. We often have people that might do a 10-night and a 7-night, or a 14-night and a 10-night back-to-back, so often extended sailings and combined sailings work very well for us. In fact, they account for a large percentage of my business now. The Baltic region and Northern Europe are very popular. Iceland, of course, has been a hot ticket for the last 18 months, Alaska – still 40,000 people out of Australia cruise Alaska every year. Alaska is still a very popular destination and I liken Alaska to doing an African safari. When you do Alaska you should do it, and do it really well. It’s one of those bucket-list destinations that you probably won’t go back and visit again. And the only way to see Alaska thoroughly is by cruise, so why compromise? Australians are also fascinated by the engineering feat of the Panama Canal. We could have put our entire fleet in Japan and sell it out. We return to Turkey in April this year after a two year break, with some lovely overnight stays in Istanbul, Ephesus, Kuşadas. Cuba is on everyone’s bucket list. We have excellent immersive itineraries there. Look out for the overnight opportunities in Havana. South America is the perfect cruise destination, enabling our guests to visit multiple countries with ease, unpacking once. We offer a circumnavigation of South America and a lifetime travel opportunity to experience the Amazon. With over 460 ports of call, the world is ready for you to discover. Australia is now Regent Seven Seas Cruises’ third largest market internationally, having overtaken Europe. Is it an aspiration of yours to have Australia move into Regent’s second largest source market in the foreseeable future? Yes of course, we are the third largest market globally, so we still have the US and UK in front of us. We’re ambitious and we are working hard to push up. For agents unfamiliar with selling Regent Seven Seas Cruises, what are some of the key selling points? Identify the guests who want to do an all-inclusive luxury cruise, or want to move up to luxury. Learn about the product to get to know all the details and the all-inclusiveness. It’s all included, no hidden extras. All suite, all balcony, intimate ships. The largest suites at sea. Are there clear and obvious distinctions between Regent’s current fleet? Yes, they’ve all absolutely got their own personality. The standard of them is all the same, and the luxuriousness of them is all the same, but they’ve all got their own little nuances. For example, Seven Seas Navigator is the smallest of our ships and has an Icebreaker Hull. She has a cult following. Our guests love her because she is smaller, and she has her real own personality. Seven Seas Mariner and Seven Seas Voyager are beautifully appointed spacious ships that have been lavishly upgraded within the last two years. When we launched Seven Seas Explorer, known as “The World’s Most Luxurious Ship Ever Built” in 2016, we invested US$125 million in upgrading the remaining fleet, so they were on the same level of luxury as Seven Seas Explorer. Just last week, RSSC announced the new Regent Suite for Seven Seas Splendor, which is being marketed as the “Largest Suite Ever Built on a Luxury Cruise Ship”. What excites you about the Regent Suite, and can we expect some other surprises about Splendor in the lead up to her launch next February? What excites me about the NEW Regent Suite and the Seven Seas Splendor is our push for constant innovation, attention to detail and the strive for perfection. We have very loyal clients who travel with us on a regular basis, we need to ensure our product offering is the best in class, our service standards set new industry benchmarks and that every luxury included is personalised and holds an everlasting memory. When introduced, Seven Seas Explorer’s Regent Suite was the largest suite ever seen on a luxury cruise ship at more than 400 square metres of perfection. Whether you’re feeling socialable or looking for some ‘me time’, the choice is completely yours. The in-suite spa has a personal sauna, a steam room, a treatment area with unlimited spa treatments as well as its own glass-enclosed solarium on top of the bridge. You can choose to host your own dinner party, with fine wines and delectable cuisine served seamlessly in your own private and palatial space. Seven Seas Splendor will launch in February 2020 and as the next 12 months unfold, we’ll reveal more of her unique features. The internal colour palette of the Seven Seas Splendor will be something special. Light, with cool greys and blues, soothing creams and blushes, with intricate marble patterns and rich woods. Simply put, ‘Luxury Perfected’. What tools are available in Australia for travel agents to sharpen their knowledge? Is the Regent Seven Seas University program in the US offered locally? In Australia we offer a sophisticated, easy to use online marketing toolkit and we publish a very useful travel agent partner guide. We have our BDMs in market and we also have a local contact centre here in Sydney currently open 17 hours, Monday to Friday and on a more limited schedule at weekends. It’s now gearing towards a 364-day operation and 17 hours per day, covering Australia. Agents tell me all the time that our contact centre [staff] are fantastic and are ‘on the ball;. But between our contact centre, our BDMs, the trade partners having my mobile, they can reach each of us – we’re all very contactable. We are looking at the benefits of adapting the RSSC University program here – localisation to make things relevant to local needs is paramount in our planning. And finally, LATTE’s signature question. What is your favourite coffee outlet and go-to drink? I love a black coffee, but I especially love an extra-hot almond cappuccino, in a takeaway cup. And I have to say that my favourite coffee outlet is Qantas’ Business Class lounge! They have the best baristas who always have a smile on their face, they make the best coffee. I spend so much time there that it’s probably my best ‘go to’ cafe. Plus they’ve even got the Skip smartphone app where you can order your coffee prior to arrival, so there’s no waiting.